This unique bridge opened in 1905 and was the very first aerial lift bridge in the USA. There was heavy demand in the early 1900s for easy access to Minnesota Point on the shore of Lake Superior in Duluth, Minnesota, or as those who lived there preferred to call the area, "Park Point." The problem of access to Minnesota Point had existed since 1871 when the Duluth Ship Canal was cut through to Lake Superior. A permanent solution for safe, reliable access was needed across the canal. Although rowboats and steam ferries of various descriptions served to get people to and from Park Point, this was not always convenient, particularly in winter months when ice choked the canal and bay. A temporary suspension bridge was sometimes put in place for the winter. It swayed in the wind and took courage or desperation to cross. Ferries like the ELLEN D., ANNIE L. SMITH, and ESTELLE, among many, served the residents of Park Point faithfully over the years. A design solution arrived at after exploring many alternative ideas was an aerial transfer bridge. This was not a new idea, but it was unique in the United States. Duluth's bridge was patterned after a suspended car bridge in Rouen, France. 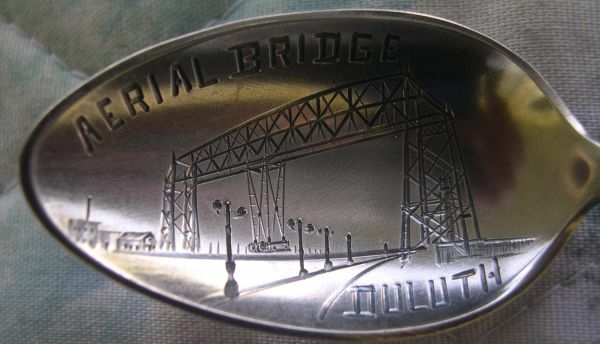 Completed in 1905, Duluth's new Aerial Transfer Bridge carried up to 62-1/2 tons including automobiles, horses and wagons, and pedestrian traffic. It took 5 cents and about one minute to transit the 300-foot wide ship canal one way, and a crossing was made about every 5 minutes when demand was heavy. Two 40 horsepower electric motors beneath the suspended car or "gondola" pulled cables which moved it from side to side while hanging from tracks mounted on the fixed truss overhead. In the event of a power failure, the motorman could hand-power the gondola across the canal. In the spoon world, we call this type of spoon a MULE. A mule is where the handle appears to be unrelated to the bowl. 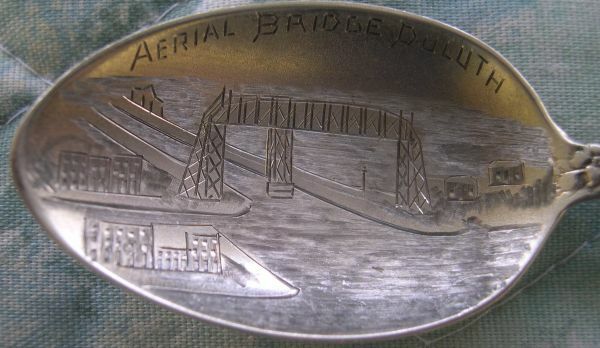 In this case, the handle indicates that it is from "Habana" (Havanna, Cuba) and the bowl is an engraved picture of the Duluth Aerial Bridge. I do NOT believe that this is a mistake or an accident, but I can only speculate on the meaning. 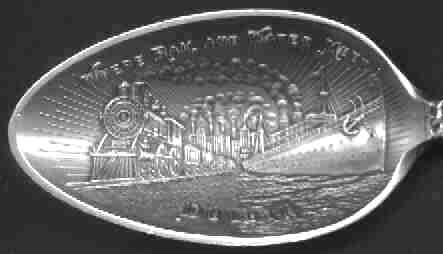 Three letters (initials) are engraved on the back. 1. 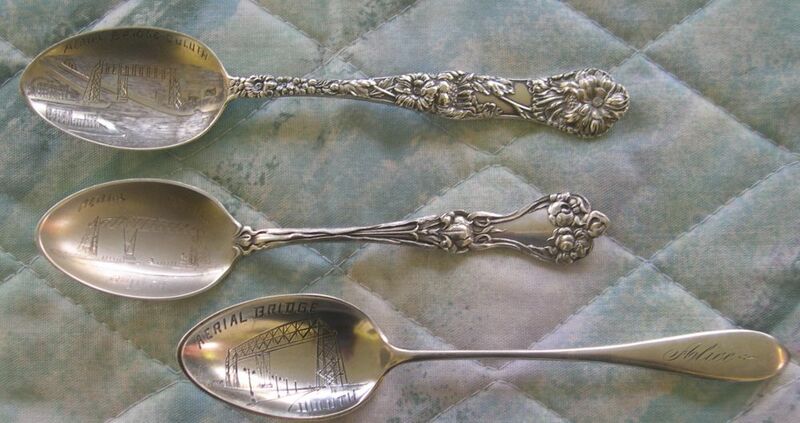 My first guess is that one of Duluth's residents was involved in the Spanish American war and bought this spoon in Havana. Sometime after returning they had the bowl and letters custom engraved. 2. A search turned up two businesses in Duluth using the name 'Havana'. One is now a chain of tobacco stores and they used to specialize in Havana cigars.The other is a restaurant and there is also a private Havana club. My guess is that at one time these businesses were all related.